Naila Hussain from Atomic Mind will be joining us for her second session on Tuesday 26th February, this time in the evening. In this session, Naila will be sharing with you some insights and tools to improve not only your own well-being and resilience, but ones you can start implementing immediately in your organisations and businesses. "To ensure your clients get the best possible experience, it is essential that your staff are motivated and are able to be and do their best. Looking after their wellbeing and increasing their resilience, reduces sickness absence, absenteeism, and other issues in the workplace. It helps build capacity, increases engagement and productivity, and improves performance. This enhances the quality of services your clients receive and ultimately enhances your brand reputation." Atomic Mind works and collaborates with individuals, organisations and schools to enable their effective achievement of their goals. Having worked as a coach and trainer for over 15yrs, Naila love's nothing more than identifying the potential from within and helping those she works with to create the success they desire. 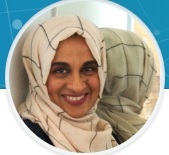 For all goals, objectives and missions are unique and individual – Naila works with you and your businesses to help achieve success – in a straight forward and engaging way.